WOOTTON, UK (May 26, 2014) - Rockstar Energy Drink driver Tanner Foust put on a strong performance at the Lydden Hill Circuit this weekend to finish his first World Rallycross Championship appearance of the year in the top five. "It's great having the opportunity to race at Lydden Hill, the place where rallycross was invented and a track that gets such huge and enthusiastic crowds," said Foust. "I always have an amazing experience here in the UK." Driving a new Rockstar Energy Drink Volkswagen Polo, Foust was an early favorite for the podium at the British event. An estimated 15,000 fans packed into the venue this weekend to take in the second stop of the 2014 World RX. In a record field of 37 drivers, the popular American driver finished all but one of his four opening heats near the top of the rankings to earn a spot in the main event. The Lydden Hill Circuit is the birthplace of rallycross, where the very first races took place more than 40 years ago. It is a challenging track that calls for smooth and tidy driving on the technical road course portions, and full-attack sideways slides through gravel. 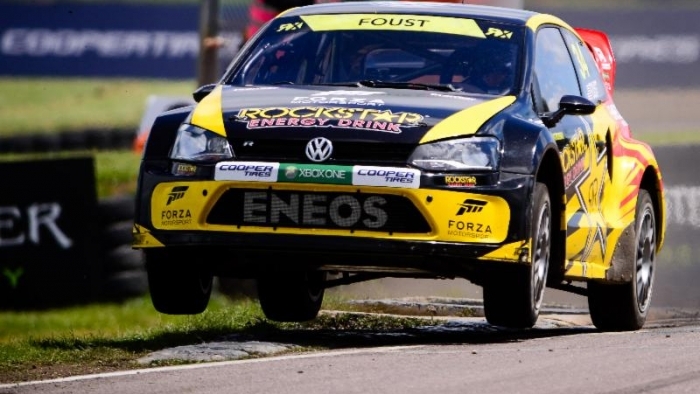 Promoted to the six-car Final at the last minute when one of his rivals was unable to come to the line, Foust lined up against championship regulars, including Volkswagen teammate Toomas "Topi" Heikkinen. He battled off the start, fighting a power steering issue, but ultimately had to slow when his car began to run out of fuel and teammate Heikkinen slipped past him at the finish. He crossed the line in fifth, ahead of former World Rally Champion Petter Solberg. The Volkswagen Polo R that Foust campaigned at Lydden Hill was developed specifically for World RX competition by Marklund Motorsport and was new to the driver this weekend. Although it is under development this season, it has already shown winning potential. "This new car has more than proven itself at the top of the field," said Foust. "To have two of the team's cars reach the Final in such a competitive field is an accomplishment and I look forward to returning to World RX next month to see what we can do in Finland." In the United States, Foust will soon debut the all-new Rockstar Energy Drink Volkswagen Beetle, a 560 horsepower turbocharged rallycross car built for Global Rallycross competition. The two-time Global Rallycross Champion is running a select season of four events in the World RX series this year and will return to Europe in a month's time to contest the Finnish round. Before then, Foust will be back in Global Rallycross competition with the Volkswagen Andretti Rallycross squad at X Games in Austin, Tex., on June 7. He has also held multiple world records including for the astonishing Hot Wheels Double Loop Dare, which saw Foust drive a car through a 66-foot loop-the-loop. He also scored the indoor speed record for TV's Top Gear USA, and set a distance jump record with Hot Wheels when he made a 332' ramp-to-ramp leap in a truck at the Indy 500. His varied race experience includes multiple years of open wheel competition, the Pikes Peak Hill Climb, rally racing, various types of sports car racing and the SCORE Baja. He has represented the USA in the annual Race of Champions three times, teaming with NASCAR star Carl Edwards in 2008, Travis Pastrana in 2009, and Mick Doohan in 2010. A year after making his overseas debut in the European Rallycross Championship in 2010 with a select campaign, Foust became the first American driver to win a round of that championship and finished both 2011 and 2012 ranked in the top three; he won two of the three rounds he entered last year. At home, Foust has been a dominant driver in rallycross since it was first introduced to the United States in 2010. When he isn't racing, the professional driver also performs in films and on television. He is an on-air host for the U.S. version of the seminal BBC auto show Top Gear, produced by BBC Worldwide Productions and airing on the HISTORY channel. Episodes of his online documentary series, Life in the Foust Lane, are available on the Rockstar Energy Drink YouTube channel. Foust also handles stunt driving in numerous popular films, TV shows and commercials. He is featured as a stunt driver in the upcoming Need 4 Speed film, as well as other major releases including the Bourne Legacy, Bourne Ultimatum, Fast and Furious: Tokyo Drift, Dukes of Hazzard, Red Dawn and Iron Man 2 movies.